Thursday November 15th… Dear Diary. The main purpose of this ongoing post will be to track United States extreme or record temperatures related to climate change. Any reports I see of ETs will be listed below the main topic of the day. I’ll refer to extreme or record temperatures as ETs (not extraterrestrials)😊. Response To California Fires…A New Warning System? Last night I had the privilege of partaking in a brainstorming session on social media for improving warning systems in California to alert people of wildfires and constructing safe escape havens for local residents. Thanks all for their thoughts, which were much appreciated by all of those involved. As of today I’m seeing that 56 people died in Paradise, California with over 100 still missing. Could more people have been saved if a better warning system was in place or if souls better knew how to escape ? Of course! Today I will try to summarize the discussion pointing out some nut and bolt concrete steps that could be implemented by local and federal governments with input from law enforcement. By no means am I an expert in warning dissemination, so I’d like this post to be very fluid, adding more communicated points with time. Also, it makes sense that people in fire hazard areas have a lot more input into how a better warning system can be constructed…not mainly from someone like me who resides in soggy Georgia. Today I will just play the part of the little old note taker. Sometime in the not so distant future I’d love to see some of the ideas communicated here implemented, saving lives. Beyond being interested in weather and climate, I’m definitely fulfilled knowing that some of my forecasting over the last 30+ years aided people and perhaps saved a life or two. 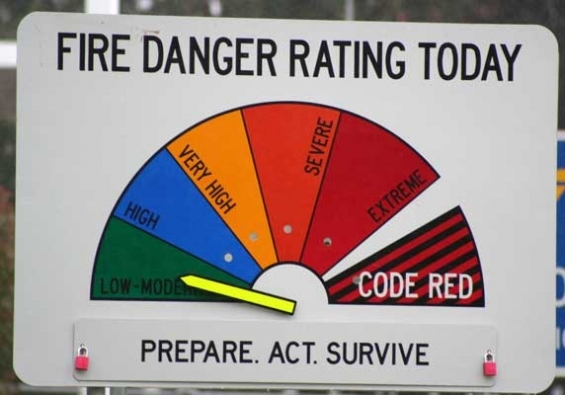 Seeing a better fire warning system for California and other areas of the West coming out of the tragedy from this week would tickle me pink. The first idea I saw was to start implementing “fire warnings” by the National Weather Service. These would act much like flash flood or tornado warnings giving those affected as much time as possible to respond. Most of those who died this week in the fires were not aware of impending doom, not having enough time to react. One reason that tornado deaths have been going down over time is because weather technology via doppler radar and warning systems have been improving. We now have satellite fire sensing capability along with surface observations for wind that should alert and give forecasters enough time to issue a warning after red flag warnings (or fire watches) have been issued in the prior 24 hour period. Ultimately I wonder if NWS and others should think about working toward issuing fire warnings for communities similar to svr tstorm warnings/tornado warnings. But we're a long way from getting there, science-wise. One could argue that a fire is not a purely meteorological phenomenon–but then neither is a flash flood, so one could draw a straight line from NWS flash flood warnings to fire warnings. That's essentially what we're saying. Tornado warnings rarely give more than 20-30 minutes of advance notice, yet they save a lot of lives. Obviously, it's harder to escape from a wildfire than a tornado (i.e., go in basement), but in many cases that would still be enough. Yea for sure. I was nearly yelling at the camera about ERCS in the days-week leading up to the Camp Fire. ERCs were locally >99 percentile. 40-50 mph winds and single digit RH. I think the average person doesn’t understand dry and EXPLOSIVELY DRY. One thing, for sure, is to not have so many different watches, advisories or warnings being issued as to confuse the public. A system needs to be in place to first communicate awareness of potential fire danger, then if necessary a life threatening warning. Daniel’s last point led to the idea of having residents either construct fire shelters on their property if they wished and/or designating some well built building to be a community safe haven where people can go to in a time when dry Santa Ana winds are howling with a high elevated fire threat. In the Midwest being aware when storm threats are elevated is now second nature. Students during tornado drills often practice by learning how to quickly protect themselves under desks. Obviously loners living well up in the hills could not go to any shelter and would either take their chances of not being affected by a fire or building their own underground shelter, much like those constructed for storms in the Plains. Perhaps a community shelter would have helped in the town of Paradise. Locally (in Southern California) I have a passel of NOAA EAS capable radios which were on during the height of the Woolsey Fire, and never got a warning like you get with a flash flood or tornado. Not sure why that is; not the solution but would helped. Closer to home, I was listening when the Woolsey Fire charged into Thousand Oaks along Erbes Road. Fortunately no fatalities, but I distinctly remember the radio calls: "these people can't f***ing hear anything, we got to wake them up and out of here!" as they pounded on doors. We need an emergency siren alert system as they have in the Midwest for tornados. People living across possible burn areas should know their best escape routes, particularly for children. Education via local law enforcement community outreach would be a big plus here. As I pointed out I’ll be refining this post with time, adding more good advice and suggestions. Hopefully any ideas written here will help policy makers. At least I know that many professional people in the field of meteorology are thinking about these “low hanging fruit” items that can soon be implemented to both improve peace of mind for residents. and save lives. “(As the Camp Fire grew rapidly and spread toward Paradise and the Upper Ridge on Thursday morning, evacuation messages were reportedly sent to both land-line phones and cell phones through the county’s CODE RED mass notification system. However, it appears that officials sending the CODE RED messages and going door to door were hard pressed to keep up with the fire’s pace. Moreover, residents with cell phones had to have signed up in advance in order to receive the phone alerts. A state law passed in September will allow counties to automatically sign up residents whose cell-phone numbers are associated with utility bills. The overarching Wireless Emergency Alert system (WEA) for cellphones was not employed in Butte County during the Camp Fire, reported the San Jose Mercury News. The WEA sends certain emergency messages such as tornado and flash flood warnings to newer cellphones as long as the phone owners have not opted out of the service. Some California counties have hesitated to use the WEA for fire evacuation out of concern it would serve as a blunt instrument, alerting too many citizens outside precise evacuation zones and causing traffic tie-ups. Sonoma County officials chose not to use the WEA during the catastrophic fires that struck in October 2017, including the Tubbs Fire—the state’s most destructive blaze on record prior to the Camp Fire. From Andrew Freedman’s Axios note apparently lack of communication between local officials and the NWS prevented a “fire weather warning” from being issued. It’s my opinion should weather forecasters have a very good reason for issuing a warning they should be allowed to do so, without relying on a “go ahead” by any outside agency. The bigger issue is developing a paradigm similar to that for severe, where larger-scale, longer lead-time products cascade into increasingly urgent, higher impact, shorter duration products. I know discussions are being had, but this is a big ship (many partners) to turn. The use (or lack) of WEA and reverse-911 was subject to a DHS-FEMA hearing, and in articles last year on North Bay and Santa Barbara fires (see https://t.co/nRgM2qYg0r and https://t.co/xIFzYW1HdI). Should be part of a multi-pronged notification solution. Last resort=door2door. Extreme Temperature Diary-November 14, 2018/ Topic: New Brazilian Politics…Warning From Dr. Suess…Game Over For The Climate? Thanks Nicholas for your response and interest on the subject of fire warnings. I do hope that bureaucracy can be cut through to improve all warning systems.